Orchestral Percussion and Classroom Mallets and Drum Sticks. 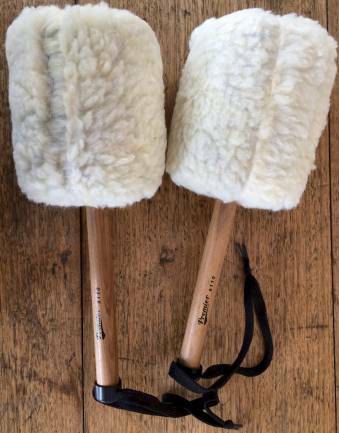 I am clearing a range of orchestral percussion mallets. This includes mallets for bass drum, vibraphone, glockenspiel, xylphone and drums sticks. All Premier items are genuine. Some items are new old stock, in that it was brought into the country some years ago, but brand new. All prices are inclusive of GST. I am able to organise freight, if required. Cost varies with destination. For schools wishing to order, I am able to provide ABN and invoice the school. I have a range of Premier Mallets available, as follows. These are all new, but old stock, and have been sitting on a warehouse shelf for possibly years. All being sold at greatly reduced prices. Premier black label maple sticks $15 pair (normally $30). Premier P-47 and P8 and 3A: $5 a pair. Hickory. I am able to freight anywhere in Australia. Cost will depend on destination. As shown in the photo. 2 1/2 inch nylon shaft. 8 pair left. Normally $90. Price $30 pair (GST inclusive). As shown in the photo. 3 pairs left. Price $30 pair (GST inclusive). As shown in the photo. Bass drum, hard alloy shaft. 10 pairs left. Normally $129. Price $30 pair (GST inclusive). As shown in the photo. Bass drum, hard. 2 inch alloy shaft. 1 pair left. Normally $89. Price $30 pair (GST inclusive). As shown in the photo. Bass drum, hard. 2 inch, alloy shaft. 3 pair left. Normally $72. Price $30 pair (GST inclusive). Normally $80. Price $30 pair (GST inclusive). As shown in the photo. Bass drum, hard. 1 1/2 inch alloy shaft. 4 pair left. Brand New old stock, perfect Condition. 1 pair left. As shown in the photo. Vibraphone medium. 2 pair left. As shown in the photo. Vibraphone soft, for jazz. Light blue, wool wound, ratan shaft. 9 pair left. As shown in the photo. Xylophone hard. Rosewood for rosewood bars. Ratan shaft. 1 pair left. Price $20 pair (GST inclusive). As shown in the photo. Made in England. Number 0, (little ones). 3 pair left. I have a range of mallets that are mainly used in the classroom with classroom percussion, or often called "Orff" style instruments. These mallets are mostly used for Glockenspiels. Price $5.50 pair (GST inclusive). 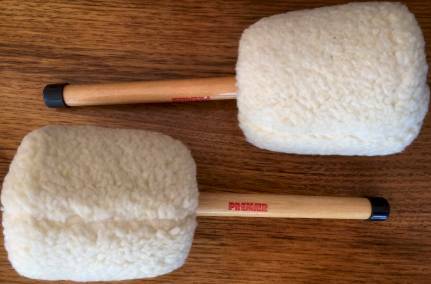 These mallets are mostly used for Soprano Xylophones, Glockenspiels if you want a slightly softer sound than the mallets shown above, or top end of a Marimba. The black ones are 25mm diameter hard rubber heads, $5.50 pair. The yellow are 20mm diameter and a bit softer. Price $4 pair, or $2 pair for 10 or more (GST inclusive). These mallets are mostly used for Alto Xylophones, the top end of bass xylophones, or middle of the Marimba. These are Angel brand, and are softer heads with woven wool covers. Nice wooden handles. Price $11 pair (GST inclusive). These mallets are mostly used for Alto Xylophones, the top end of bass xylophones, or marimba and vibraphone. Various hardness, from No3 to No5. These mallets are mostly used for Bass Xylophones, or bottom end of a Marimba. These are made by myself, using soft coloured bouncing balls. Colours and size will vary depending on what I have available. Diameter of the heads varies between 32mm and 40mm. These mallets are mostly used for Bass Marimba, the type that starts 2 octaves below middle C. These are made by myself, using 60 mm diameter soft rubber balls. Colours will vary depending on what I have available. The pen is in the photo to give an idea of size. Price $15 pair (GST inclusive). As shown in the photo. Very soft heads.